Atlassian presents Bamboo 3.1 with Tasks, parameterized builds and support for Bitbucket and GitHub. Upgrading to Bamboo 3.1 is free for all customers with active Bamboo software maintenance. Please keep logging your votes and issues . They help us decide what needs doing! You can download Bamboo from the Atlassian website. If upgrading from a previous version, please read the Bamboo 3.1 Upgrade Guide. Tasks in Bamboo 3.1 provide developers and build engineers with another tool to design more flexible builds. Configure a Job with Tasks to build your application, execute a script, upload files to another server, create your documentation and much more. Bamboo allows you to add as many Tasks as needed for a Job, with each Task providing detailed log messages during the build. Tasks are executed against the same working directory, allowing you to perform actions like changing version numbers or copying files before a subsequent task is executed. We've also implemented Final Tasks as part of the Tasks feature. No matter what happens in your previous tasks, Final Tasks will always be executed at the end of the build. This gives you the opportunity to clean up after your build, shutting down processes or services that you may have started as part of your build. Parameterized Builds allow you to customize parts of your Build when the Build is run manually or via a script. 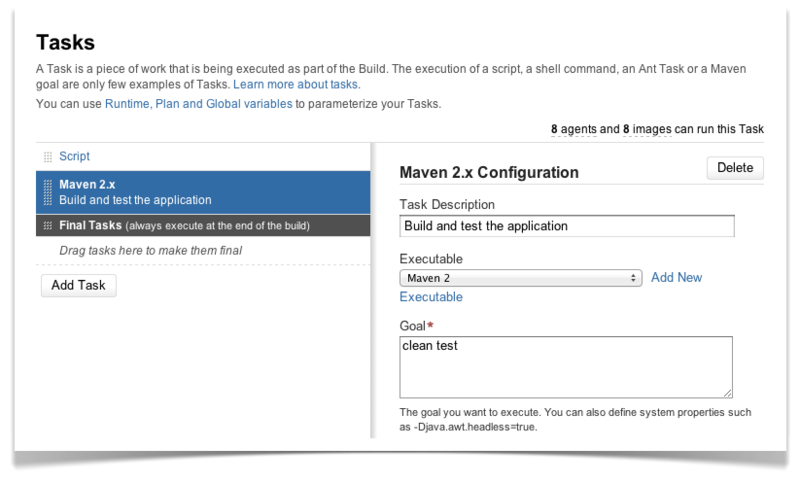 We've introduced Plan variables in this release to complement the existing global variables. This allows you to change version numbers on the fly or change certain options you use within your script or commands for particular builds. Visual Studio – Build Visual Studio projects with devenv.exe. The Task also allows you to switch between different architectures (x86, AMD64, IA32, IA64). MSBuild – Run MSBuild as part of your build. NAnt – Execute NAnt targets to build your project. MSTest Runner – Run your MSTest configuration and display the MSTest results. MSTest Parser – Parse and display MSTest test results. MBUnit Parser – Parse and display MBUnit test results. NUnit Parser – Parse and display NUnit test results. The plugin is open-source. Feel free to fork it on Bitbucket. 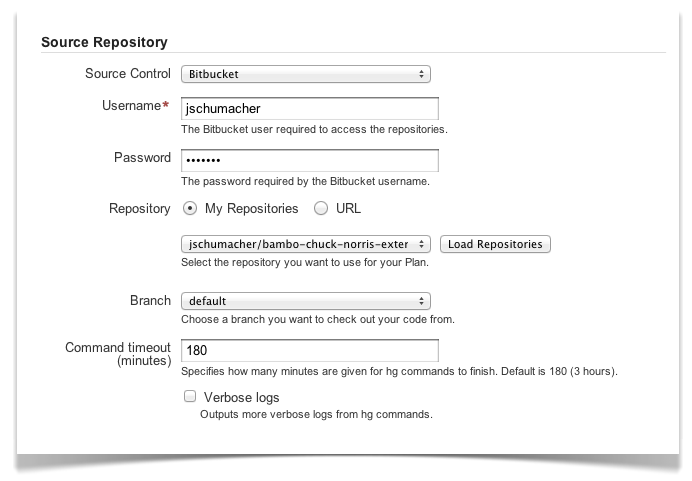 Bamboo now supports Bitbucket. If you use Bitbucket for your source code hosting, you can use Bamboo to build any source code maintained in repositories on Bitbucket. We've extended our Git support to include GitHub. If you use the GitHub for your source code hosting, you can use Bamboo to build any source code maintained in repositories on GitHub. 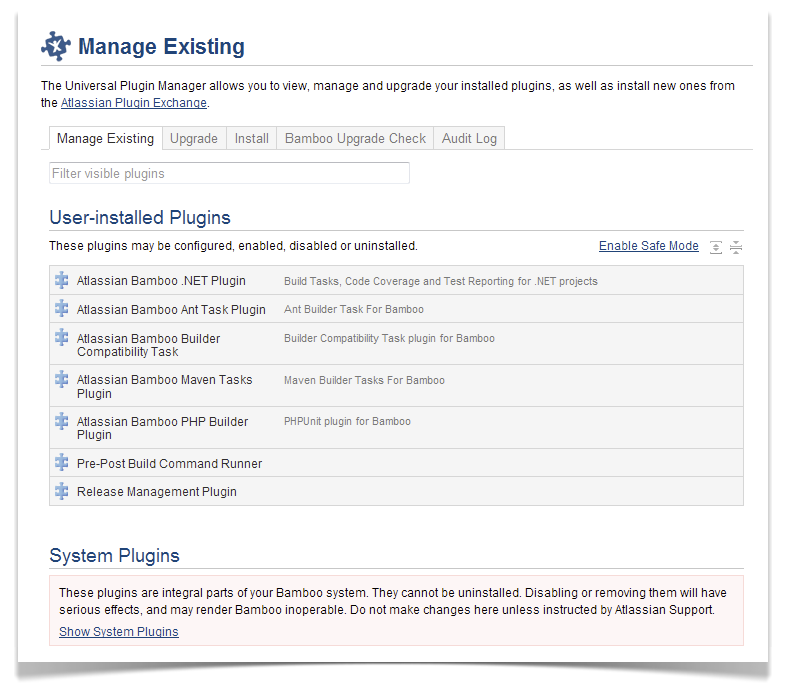 Perform a plugin compatibility check before upgrading Bamboo. Install new plugins from the Atlassian Plugin Exchange. With just one click, upgrade all plugins that have updates available. View and track updates via the audit log. 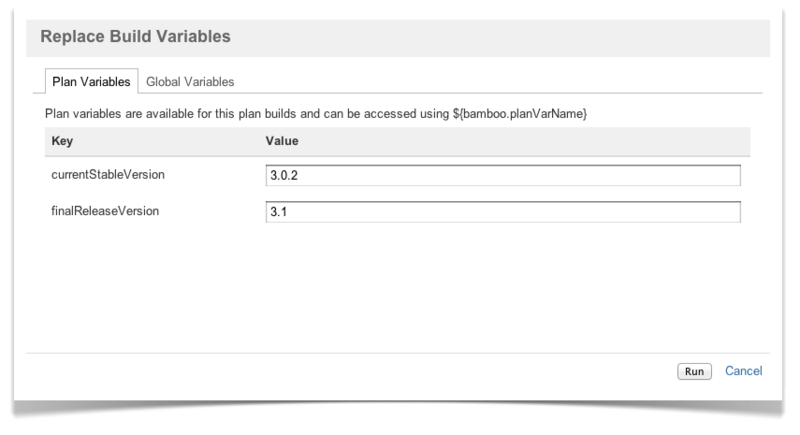 Bamboo now supports Amazon EC2 Spot Instances. If you are using Elastic Bamboo to run builds in the Amazon Elastic Compute Cloud (EC2), you can now bid for and use EC Spot Instances. 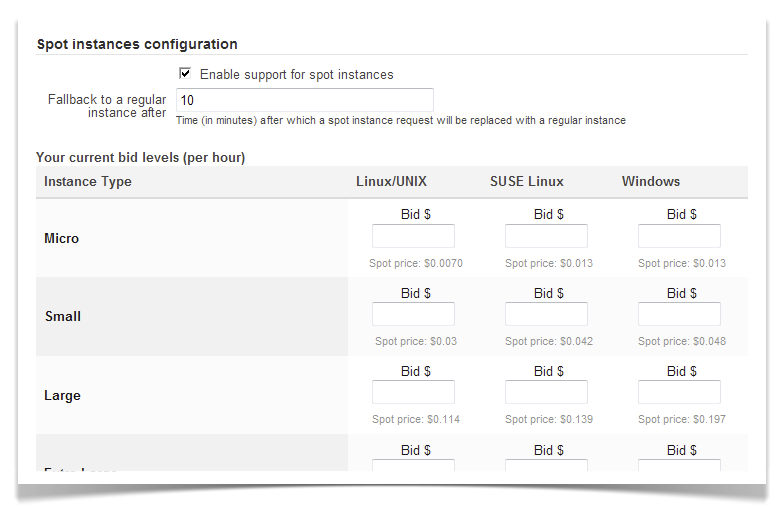 This allows you to run your builds at a much lower price, provided that your bid exceeds the current "spot price" (determined by EC2 customer demand). Bamboo 3.1 adds a personal touch to your CI environment with the introduction of Gravatar support. If your users have signed up to the Gravatar service, Bamboo will attempt to retrieve their profile pictures and display them in Bamboo. You'll see these profile pictures displayed against activities for the user, like code changes and comments on build results. In previous versions of Bamboo, processes started from .bat scripts or a number of different methods were not shut down properly. We have improved the Windows process handling in Bamboo to ensure that the underlying processes and their children are stopped correctly.